I was recently invited to join the Fennel Friday Cooking Club hosted by The Hungry Goddess and Pollen Ranch. Each month this group of enthusiastic bloggers will be creating recipes using a different Pollen Ranch product and focusing on a different theme. This month's theme is flat breads, pizza or bruschetta and the product is fennel pollen. I decided to go with a breakfast for lunch kind of bruschetta. Eggs, fennel salami, chopped tomatoes, crusty bread and a sprinkling of fennel pollen; I really had no idea I was going to love this as much as I did. It's super easy to put together and makes a nice lunch, breakfast or even appetizer. Heat olive oil in a pan over medium heat. Cook tomatoes and salami briefly, about 2 mins, and remove to a plate. Whisk the eggs with the milk in a bowl until well blended. Add the eggs to the pan and stir constantly. 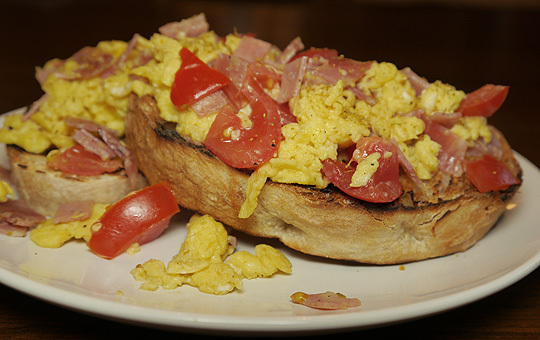 As the eggs begin to set, about 3 minutes, add the tomatoes and salami, and cook a few minutes more. Add salt and pepper to taste. I am SO tickled that you liked the Fennel Pollen - I am ready to eat this for any meal! Thank you for participating! Can't wait for next month! Eggs & fennel pollen are a perfect combination! Thanks for being part of the Fennel Friday Cooking Club!